Did you catch the Free Apple templates that I published not long ago? 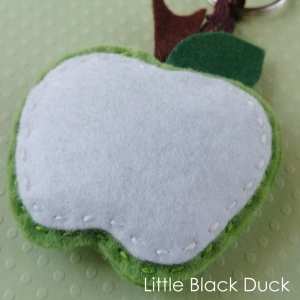 I have been using them to make some felt apple keyrings. I mounted one of felt apple keyrings onto a ‘personlised’ card that I designed for Charlotte’s Reception Teacher to say thank you for everything she has done this year. She really was the best reception teacher you could ask for. I think she was born to do the job! I hope that she liked it…. 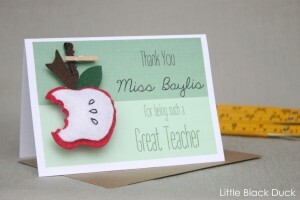 I also made a personalised card for Charlotte’s Teaching Assistant, if only I had photographed it for you to see! What do you think? Do you like the card? 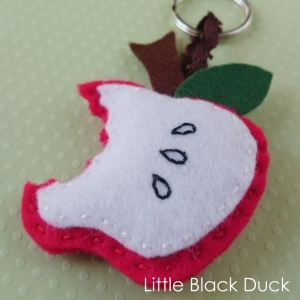 Should I consider selling personalised cards (with or without felt keyrings)?